Side brackets give you freedom to mount your desktop onto any UPLIFT desk frame. 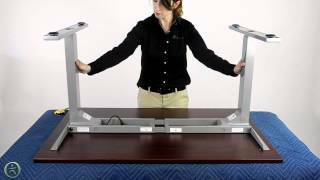 Compatible with 2-leg and 3-leg T-frame UPLIFT desks, these brackets are available in your choice of color: black, white, or gray. Side brackets are not compatible with C-frame desk bases. Side brackets let you mount your desktop onto your UPLIFT Desk frame. If you're building a DIY desk or need a new side bracket for your current desk, this is for you. Will this work on my C-frame desk? No, Side Brackets for T-frame Desks are designed to work on T-frame desk bases only. Check our Side Bracket for C-frame Desks listing if you need to replace yours on your desk. Yes! Get your T-Frame Side Bracket in white, gray, and black to match your UPLIFT Desk frame.